Eager shoppers pour into the Macy's Herald Square flagship store upon store opening for "Black Friday" 2015 on Thursday, Nov. 26, 2015 in New York. On Thanksgiving at 6 p.m., most Macy’s stores across the country opened its doors to thousands of early bird shoppers in search of sales, door buster deals and limited-time-offers. Thousands of shoppers are still choosing to line up in the stores to make sure they got the best deals. The tradition of getting there early was still going strong, according to NBC News. 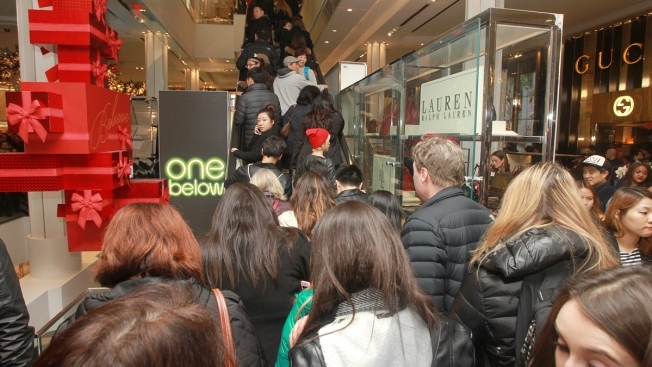 Hundreds lined nine levels of escalators at Macy's flagship store in New York City to get Black Friday deals on Thursday. Many more consumers opted to stay home and shop online, according to NBC News. Online sales increased 24 percent through 11 a.m. ET Thursday, compared to the same 12-hour period on Thanksgiving last year, according to Adobe Digital Index, which tracks real-time data for retailers. Online shops are also reporting greater sales volumes - as much as 50 percent from midnight to noon, including 31 percent at Amazon.com, online retail data aggregator, Channel Advisor, said.